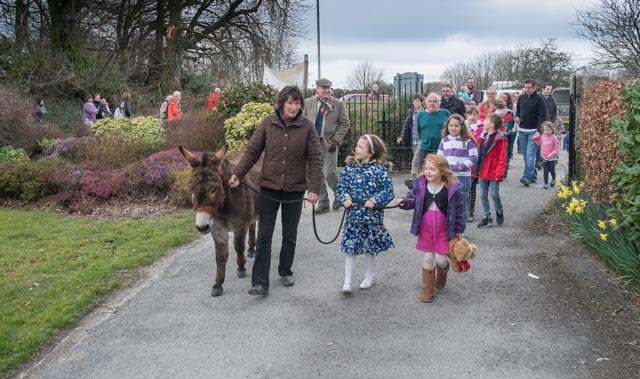 Our Nosh@9.30 Service has a Palm Sunday visitor: a donkey who led 75 of us on a short procession around St Paul’s Church grounds. We didn’t know our donkey’s name so someone suggested the name “Olive”; someone else suggested “Palm-olive”… There was a loud groan in our service at that suggestion. In our service we remembered Jesus’ triumphal entry into Jerusalem and the children led us in prayer which they had written on paper to resemble palm leaves. Everyone was given a palm cross as a reminder of Jesus’ death on the cross for us. This service marked a great start to Holy Week and our lead up to Easter. Mission Community, Nosh@9.30, St Paul's. permalink. Sniffing toilet rolls in church….